Your advocacy efforts are an important factor in helping to shape public policy about wolves. Meeting with your legislators face-to-face is the most effective way to get your message across and the best time to meet with them is when the legislature is not in session and they are in their home district offices. Members of congress are on break now and will be in their home districts now (February 20, 2016) Click HERE to find your members of congress. Senators from Midwest and Wyoming introduce bill to strip protections from endangered gray wolves. The legislation would stop citizens right to challenge this legislation in a court of law. 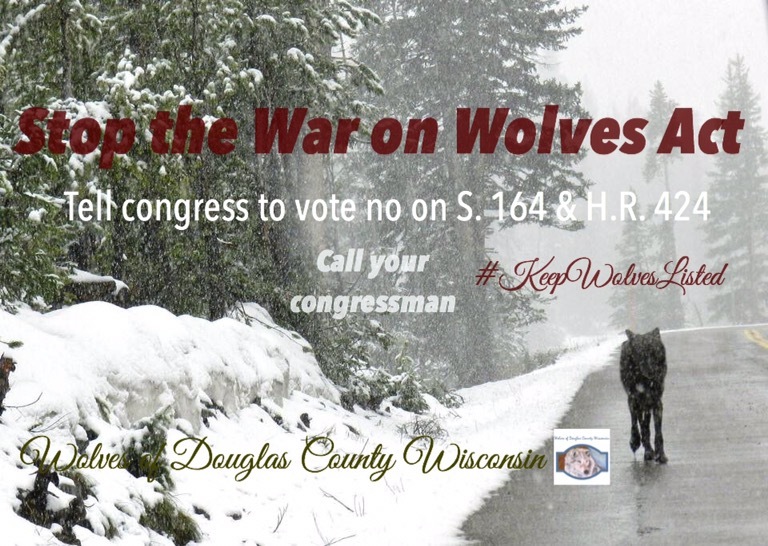 There are currently two bills in congress that call to delist the wolf in four states, S. 164 (Senate) introduced on 01/17/2017 by Senator Ron Johnson (R-WI) and H.R. 424 (House of Representatives) introduced on 01/10/2017 by Representative Collin C. Peterson (D-MN).